In all but the quietest galaxies, new stars are continually being formed from cosmic dust and gas. Has it always been like this? Did all the stars in the Milky Way form in a slow trickle, or were there bursts of star formation like we see in some other galaxies? What can we say about the history of star formation not only in our galaxy but in all the other galaxies we observe? 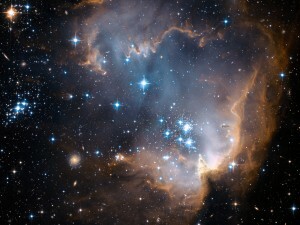 New stars being formed in the nebula NGC 602. Credit: Space Telescope Science Institute. These are good questions. For one, understanding how galaxies form and evolve is important in its own right, and this is one of the big puzzles in astronomy today. There’s a subtler point, however: when we use the luminosity and spectrum of a galaxy to estimate its age, mass or other physical characteristics, we first need to make some assumption about its star formation history. For instance, is a particular galaxy blue because it’s young and new and still forming stars, or is it old and just undergoing a burst of star formation? We could say that galaxies probably slowly shut down their star formation, but if we want a star formation history that we can use, we have to be more specific. 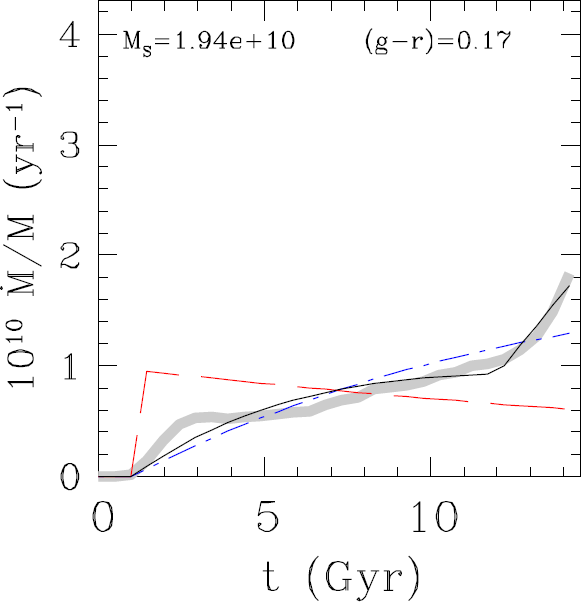 We need to come up with some empirical equations (a “parametrisation”) for the star formation rate (SFR) as a function of time, and hope they’re good models of a galactic star formation history. An empirical equation is one we invent to model the data, not one we derive from theoretical principles, and so we have some freedom in how we define it; the most popular choice is an exponentially-declining star formation rate. This paper is about testing how good this or other star formation histories (SFH) match galaxies in practice. The authors start with a cosmological simulation (a smoothed particle hydrodynamic simulation) that does a good job of reproducing what our universe looks like today. 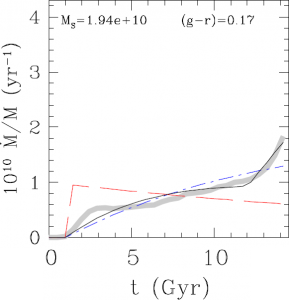 With this they can see the rate of star formation for each galaxy as these galaxies grow and interact, and they try fitting different empirical SFH equations to see which fit best. The classic exponentially declining model is tested, along with several others, including a more complex one provided by the authors. The simulated star formation history (grey line) and model fits. An exponentially declining SFH is plotted in red, whereas the authors’ parametrization is the solid black line. Clearly the black line provides a better fit. From Figure 4 in the text. The results are perhaps not surprising: the more complex model can do a better job of fitting the SFHs than a simple exponential. However, the exponential model, while not perfect, is popular because there’s only one parameter you can adjust (only one knob to tweak) which makes the star formation rate decrease faster or slower in time. This makes finding the “right” setting fairly easy in practice, even if we know it’s not going to be perfect. The complex model proposed by the authors uses four adjustable variables and is more flexible and accurate, but in practice we might not have enough data to find the right settings. This sort of trade-off is a typical problem we face when modeling galaxies. In the end, we never observe a galaxy’s full star formation history, but only a snapshot of how it appears to us today. Working backward to the full SFH is difficult in practice, but figuring out the best models, like this one, gives us a better guess of what it should look like.